Our emphasis involves the most current research on indoor-air-quality, energy-efficiency and durability. Healthy, efficient homes begin with control over airflow. Start with the building envelope, ensuring code minimum or better, levels of air-tightness. This allows control and better ability to meet the current recommended ventilation rates of outdoor-air. 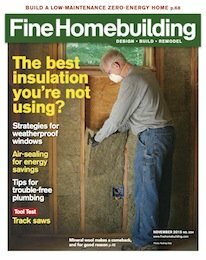 Insulation wont work without airtightness and indoor-air, is not healthy without outdoor-air ventilation. Windows are often the weakest parts in a building envelope but represent the most opportunity. Form, function, energy performance, durability and passive survivability rely on the performance of windows and their integration with the building envelope. Windows are expensive, but unlike most building materials are capable of energy performance paybacks. Current levels of window performance are not matched by most current installation methods. Much like insulation is weakened without verifying airtightness, window energy performance is overshadowed by installations leaking water or air. Keeping water out, letting it back out when it get's in, and making everything airtight is not simple but it is easier with some simple techniques. Weather barrier failures are responsible for most home destruction and decline. Even small, hidden leaks create mold, mildew and rot, impacting indoor air quality and long term durability. Withouth the right details, thermally efficient homes are more at risk from moisture problems and premature decline. Older homes often last longer because they have smaller amounts of insulation, which facilitates better drying. With modern levels of insulation, we need better weather barrier details to increase the drying potential of exterior finishes like siding and trim. This helps protect the structure and indoor-air quality. These details also reduce maintenance and extend time between needs like restaining, painting or replacement. Top 3 Ways Water Destroys Homes Rainscreens Breathing Walls ? Be aware of the common construction pratices that researchers find the most problems with; vented-crawlspaces, combustion appliances inside the building envelope, and attached garages. There are ways of reducing risks with these methods and eliminating them is a good first choice. Heating and cooling represents the biggest energy use in homes. Energy efficient building envelopes changes how we look at systems and strategies. 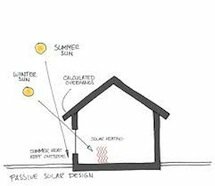 Passive solar design is the most cost effective way to heat. High performance building envelopes, solar PV and super efficient heat pumps are being used in cold climates to keep homes comfortable without indoor combustion for similar costs of conventional construction.